Let's talk hair; everyone's hair, to an extent, is exposed to some sort of damage. Whether it's bleach, colour, sun exposure, environmental damage or hot tool damage. In a day and age in which you can go from brunette to blonde in a matter of hours, I feel it's important to highlight the measures we can take to ensure our luscious locks stay strong and healthy for as long as possible. If you've followed me for a while, you'll know that I've been on quite the hair journey; just last year I had pastel pink hair which was cut into a long bob, or a "lob". Since then, I've vowed to keep on top of my hair care and grow out my hair until I had rid all of the damage. This was harder than it seemed (first world problems, I know). I had to urge to bleach and dye my hair vibrant colours and chop it off so it was easier to manage. Fast forward a year and my hair is now past my chest, thick, and feels incredibly healthy. However, the shine and strength to my hair was only apparent straight after I'd washed it. It seemed to fade over the days and look dry and split on the ends. I did some digging and found that that that hair car I was using at the time was just coating my hair with silicone, to give a shiny, glossy feel. It wasn't nourishing my hair at all, in fact, quite the opposite. I learned that the products I was using were tested on animals and contained animal based derivatives - yuck! I noticed product build-up on my scalp, which was causing my scalp to appear greasy and also flaked off. After a while, I noticed that my dry skin (on my scalp) was a mess - it was flaking off and on top of this, the product build-up looked horrendous. It knocked my confidence as I couldn't wear my hair in certain ways (out of fear that someone would see my flaked scalp and think that I was gross) and my skin felt dirty and irritated. 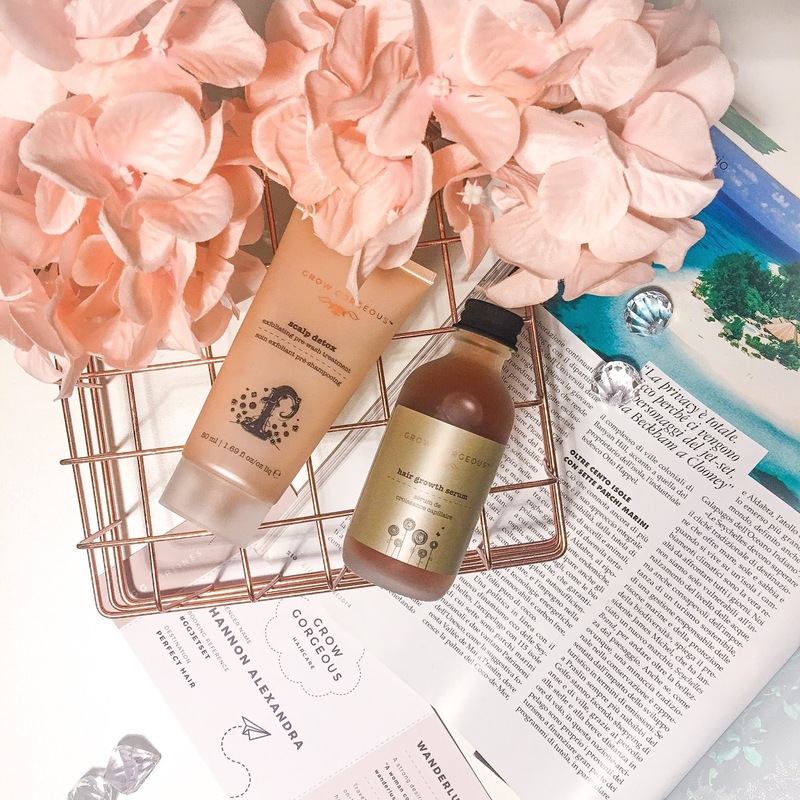 If you've read my previous post on Grow Gorgeous hair care, you'll know all about the Scalp Detox I've been using - it has saved my poor flaky scalp! I use the Scalp Detox twice a week - so, every time I wash my hair. It has the same consistency as my exfoliator and feels cooling and relaxing when applied. At first, I was skeptical, why would I put tiny bits into my hair when I'm trying to eliminate the tiny bits from my scalp? Then I thought about it for a second, and it started to make sense - I exfoliate my face in order to rid dead skin cells and dry skin, so it's essentially the same thing but for my scalp. Using the Scalp Detox alongside the GG Growth Serum made the world of difference to my hair - it was noticeably shinier and didn't dull after a few days. Moving on to the exciting stuff: new launches. I was kindly invited by the team at Grow Gorgeous to a launch party over breakfast at The Sky Garden in London. I'd never been to The Sky Garden before but I'd seen plenty of my fave bloggers' photos, so I was excited to experience the place for myself. It did not disappoint - the location was incredible and the photos I took don't do the views any justice. If you're ever in London, I would highly recommend visiting - you can get free tickets to visit if you book in advance! I was hoping that the new products would be a shampoo/conditioner combo, as I was still looking for an alternative. The event was headed by leading celebrity hair stylist, Lewis Pallett. What I loved most is that he was really taking the time to get to know each individual and their hair story, then offer up expert advice and products to cater to them. I really appreciated the time and effort that Lewis and GG put into the event. It was the most informative and friendly blogger events that I have ever been to = everyone got along (which is mostly out of the ordinary for blogger events!) and chatted to one another, we all took photos for each other, and hung out after the event. So, what's new? Grow Gorgeous have launched a new line of products which currently consists of a shampoo and a conditioner. It's called the R&R Rescue and Repair for damaged hair. Can you imagine my little moon face lighting up when I walked into the room an saw the bottles on the table?! From the get-go, I had high hopes for this line and I was willing it to live up to the same standards as the Scalp Detox and Growth Serum. The R&R range repairs your hair from the inside out; it works to strengthen. nourish and repair your hair to reduce breakage and splitting by reinforcing hair fibres. When Lewis and the GG team were explaining how this range works, I was very intrigued and excited to delve into trialing it for myself. As always, there is a comprehensive breakdown of the ingredients within these products and what they actually do, so that you know exactly where you're putting your money. Sea Satin: An extract from sea beet which helps to strengthen the keratin fibres within the hair. This helps to soften and strengthen hair damaged by heat and chemicals (hot tools and hair bleaches and dyes). It is also widely used in natural medicines and helps to heal and reduce scarring. Sea beet is rich in vitamins A, B, and C, various minerals, and carbohydrates. It also has detoxifying properties which help to rid toxic metals and substances. Keratrix: This is a restorative complex derived from tree extract which aids the binding of molecules within keratin fibres, which means each strand of hair is being strengthened. It rejuvenates the stands and adds resistance and elasticity. Phytantriol: A hair conditioning agent found commonly in hair products. It helps to repair chemically treated hair and leave it looking and feeling shiny and supple. Chia Oil: Everyone knows that chia seeds are a high source of protein. Your hair is essentially strands of protein woven together. Incorporating chia oil leaves your hair protected from damage and adds glossiness. This is also excellent for thickening hair in sparse areas and helping it to grow. Bamboo Extract: It is the richest source of natural silica, each plant contains 70% organic silica which aids the hair growth process and also builds on broken hair to replenish it. Bamboo also helps to thicken hair. Murumuru and Cupuassu Butters: These work to restore natural elasticity to your hair. They work alongside each other to increase conditioning and replenishing, helping to keep your hair soft and sleek. I've been using the R&R range for a little while now and I've already noticed a difference in my hair and scalp. I've been using the shampoo and conditioner in combination with the Scalp Detox and the Growth Serum drops and my hair has so much clarity and feels soft and healthy. My hair is left feeling light and clean; soft and supple. As of yet, I haven't noticed any extraordinary hair growth, but I have noticed a slight growth, especially in my shorter layers/fringe. I have taken a "before" photo of my hair length and I will, of course, keep you updated on how well works. I have such high hopes for the hair growth, I just don't think I've been using the full GG hair care routine for long enough to notice Rapunzel-like results! I have, however, noticed that my hair is fuller and thicker. It feels more volumized and even. I noticed these results after just 1 week, so if you're someone looking for instantaneous volume without a hefty price tag or piling in lots of hair product - this is definitely the one for you! 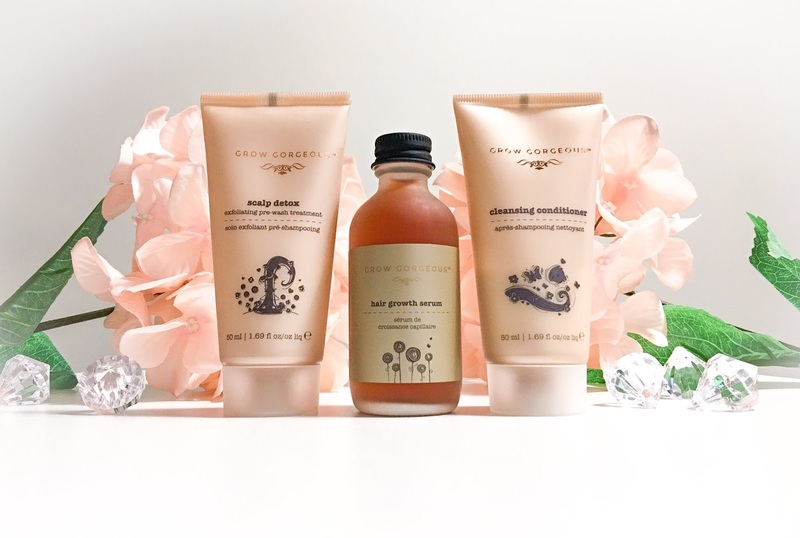 You can shop the Grow Gorgeous R&R range from Boots and the GG website. The shampoo retails at £15 per bottle and the conditioner retails at £16 per bottle. I personally think this is a fab price point for these products, as they cost a fraction of the price I was paying for my previous hair care. I was kindly gifted some Grow Gorgeous products at the launch event, which included a full-size bottle of the Growth Serum Drops - I already have two of these (one from previous gifting and once that I purchased myself!) so instead of keeping it for myself, I'd love to share the brand with you guys. If you fancy getting your hands on this GG Serum (worth £30), then head over to this Instagram post and like it! I'll choose 1 winner (UK based) on 10/07/2018 and post it over to you. If you want to keep up with latest launches, competitions and other exciting stuff, make sure to follow GG on Instagram, Twitter, and Facebook. *This post was kindly sponsored by Grow Gorgeous. All words remain truthful, unscripted and unprompted. All words and photographs are my own. This post contains the demonstration of products which have been gifted to myself from Grow Gorgeous. This post contains coverage from an event which was hosted by Grow Gorgeous. I'm a 23-year-old lifestyle, travel and beauty blogger from Sheffield, UK.